Navigating the many options and channels needed for successful marketing in this digital age requires an extensive map. As most partner companies do not have in-house marketing teams, most vendors are creating multi-channel campaigns that can be used by their partners to aid their partner’s marketing efforts. Rolling out a global partner marketing management programs require the vendors to be savvy with both channel marketing best practices, but also in the world of software automation. 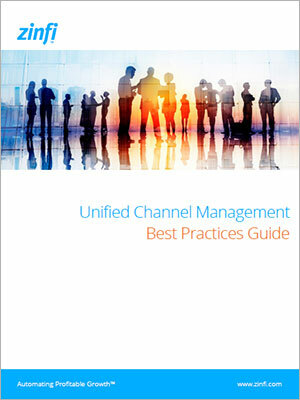 Download your COMPLIMENTARY COPY of the Unified Channel Management best practices Guidebook and know what is the Future of the Channel Industry. I consent to receive digital communications (including emails, social media messages and retargeting ads) from ZINFI. I understand I may change my preferences or opt out of digital communications with ZINFI at any time by clicking on the “Unsubscribe” link provided at the bottom of ZINFI’s email communications. Unified Channel Management (UCM) Emphasizes the importance of comprehensive, long-term strategy to tackle the enormous complexity of channel management in a global context, and explores key facets to consider to develop a truly unified channel marketing approach. One platform, many solutions. ZINFI UCM. Partner Recruitment & Engagement: Making it easy to do business with an organization allows partners to increase performance and loyalty to that specific company, and in return reduces the operational cost and complexity to serve a global channel. Multi-partner Demand Generation: Enabling partners to run integrated marketing campaigns by leveraging easy to use co-branded assets and tactics can significantly increase an organization’s market access at a significantly lower cost on a global basis. Partner Sales Performance: Empowering partners’ sales reps to be more effective at closing newly generate leads and opportunities increases an organization’s ability not only to increase market share, but also create a loyal partner base at a global level.